This bright yellow 15 cubic foot wheeled emergency response mobile spill kit cart is easy to locate and rolls quickly to the spill site. The 31" width of this emergency spill response kit allows it to easily fit through most doorways and aisles. This mobile spill kit can also easily be moved with a forklift. 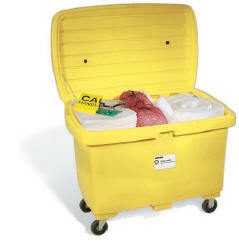 This UV inhibited emergency spill cart kit can be used outdoors and is also lockable to protect contents. For smooth and indoor surfaces we offer this cart with 5" wheels. For outdoor and rough terrain, this emergency spill response kit is available with 8" pneumatic wheels. 4 - Oil Pillows , 8"x18"
2 - Oil Net Pillows , 6"x6"
7 - Chemical Pillows , 18"x18"